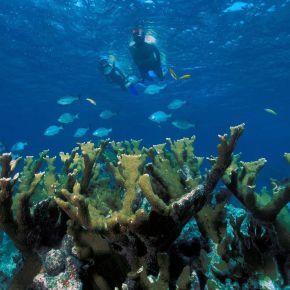 Did you know the Florida Keys is home to the second largest living coral reef in the world? Discover the magic of this unique underwater environment on a guided two-hour tour. Teeming with life you, will delight in seeing colorful tropical fish as well as grouper, snapper, live coral, and maybe even a lobster peeking out from under the coral. Snorkel gear, wetsuits, and nonalcoholic drinks are included. Trips depart daily at 11:00 a.m. and 2 p.m and 4:30 p.m.
$55 for adults / $45 for kids 12 and under. Contact Cheeca Watersports at extension 4451 for reservations and more information.